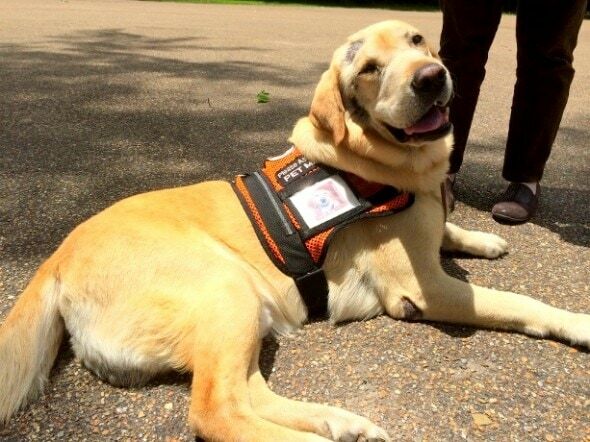 Booster the service dog was brought to Byram, Mississippi on the 7th of May for a second round of treatments in a revolutionary stem cell therapy program for his hip dysplasia by his best human friend of ten years now, Davis Hawn of Pass Christian. As Booster comes up to the backseat of Hawn’s truck, you can see in his eyes how badly he wants to just spring up onto it with youthful glee, going on a ride to somewhere hopefully exciting. However, he is simply in too much pain from his condition to make it, so Hawn gives him a compassionate “boost” into the seat. This uniquely close relationship between Hawn and Booster is what brings the two of them out to Byram, Mississippi for the second time, where he will undergo a procedure at the Randall Veterinary Hospital for his hips. This procedure involves sedating Booster and getting a blood sample to make a serum already containing his own harvested adult animal stem cells. This cocktail of stem cells and blood is then injected directly back into Booster’s hip joints. The treatments are supposed to restore and replenish the cartilage in his hips. The therapy so far is, “making him feel a whole lot better so he can roll and run and play,” Randall said. Over the past two years, the Randall Hospital has provided the same therapy to about 15 patients now. This uncommon procedure does carry a hefty price tag. It’s somewhere in the ballpark of $3,000 says Randall, and usually within six weeks of treatment, some excellent results can be seen. The key however, says Randall, is the full course of treatments, which runs six months to take full and total effect. The advocacy group MediVet America arranged the logistics and funding for Booster’s first round of shots. Booster has already survived a battle with cancer, which can be seen by the scars left from the surgery on his head, but he wears them like a badge of honor, and deservedly so. The radiation treatment from the cancer took the sight in Booster’s right eye. 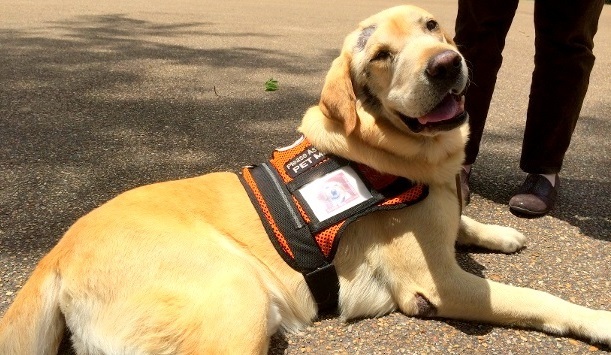 This has not stopped him from wanting to fulfill his service dog duties to the absolute best of his ability. “But he’s still on the job. He still wants to work. He’s got quite a work ethic. The idea here today, is to keep him on the job,” said Hawn. He and Booster then demonstrated just of few of the quality services Booster has to offer. Hawn is a sufferer of PTSD, or post-traumatic stress disorder. Awhile back, a former roommate of Hawn’s, who, unbeknownst to him, was on drugs, took a knife to him and almost killed him. The man then stole his truck, which was later recovered by police two weeks later, with Booster still in it. It was almost 100 degrees outside of the truck, with it being at least 120 inside it. Luckily the driver of the wrecker hired by police to recover the vehicle (Hawn) heard Booster’s puppy cries, and the window was smashed, and Booster was saved. Booster had been given to the roommate by Hawn before the incident. Now Hawn has a much different feeling towards his best buddy Booster.